If you read this blog frequently, you know that I am a big believer in making easy money online. From blogging to side hustles to affiliate marketing to taking surveys for money, there are a ton of ways that you can get paid while sitting on your computer or phone. However, I would argue that by far, the easiest way to hustle some cash online is using referral programs to make money. The beauty of referral programs is that they don’t require you to work for every dollar, plus, unlike pure affiliate marketing, there is usually something in it for the person you are referring. Regardless of how you like to get paid referrals (friends, blogging, paid advertising, social media, etc. ), here is my list of the best referral programs to make money, divided by category. Swagbucks is a great way to earn money online and has an awesome referral program. You are rewarded $3 for each referral that signs up, plus 10% of their future earnings, which can be huge! Read my Swagbucks review or Sign up for Swagbucks now. The extremely similar relative of Swagbucks, MyPoints gives you 25 points up front and a 10% bonus on all of your referral’s future earnings. Sign up for MyPoints. I think iBotta is the best in-store cash back shopping app. A paid referral will net you $5, plus you can get bonuses when you refer multiple people. Sign up for Ibotta. The home of the Big Fat Check, Ebates will give you cash back for shopping online or in-store as well as offering one of the best referral programs, with your referral getting $10 and you getting $25. Read my Ebates review or Sign up for Ebates for free. 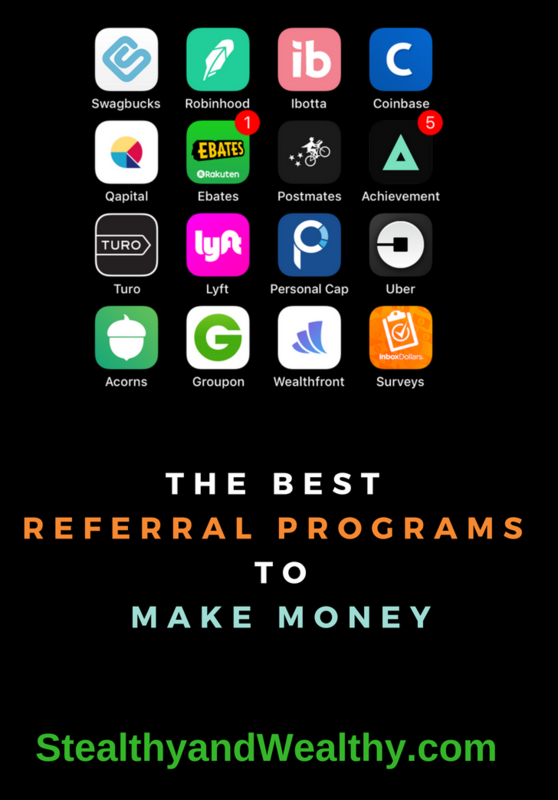 Groupon is probably the most well known of the apps on this list, but they still offer one of the best referral programs out there. You get a $10 credit on Groupon for every person that you sign up. If you don’t already have a Groupon account to start referring people, you can get started here. InboxDollars is similar to MyPoints and Swagbucks with so many ways to earn, including daily emails that pay you just for clicking them (hence the name). When you refer a friend to InboxDollars, you will get 10% of their earnings for life. Get started with Inbox Dollars and get a bonus by clicking this link. Robinhood is probably my favorite app of all time. Robinhood lets you buy and sell stocks for free with no minimums, fees, or commissions. They also have one of my favorite money making referral programs. When you refer someone, you each get a random share of stock for free, picked from the most popular stocks on Robinhood. If you don’t already have an account, you can get a free share of stock by signing up and you can immediately start referring friends. Personal Capital lets you see all of your finances in one place, with insights and analytics that help with budgeting, allocation and investing. They also have services to help you manage investments if you choose to go that route. Their paid referral program gives you and your referral each $20 when they sign up. If you don’t already have an account with Personal Capital, you can get $20 for signing up through this link and start referring people now. Qapital is an automatic savings app that allows you to “round up” purchases and save toward a goal. When you refer people through Qapital, you and your referral will both receive $5 after they make their first deposit. Click here to sign up for Qapital and get $5. Wealthfront is my favorite robo-advisor for a lot of reasons. In addition to being easy to use and managing investments well, they also have one of the best referral programs that I’ve seen. For every referral that signs up with your link, you get an extra $5,000 managed for free. While it’s not immediate cash in your pocket, if you build your Wealthfront portfolio over time, this can be a huge value. To get your frist $5,000 managed for free and start referring friends, sign up for Wealthfront now. There are a ton of different credit cards that have paid referral programs, but many of them go through third-party affiliate networks, or require you to sign up as an affiliate. I love the Southwest Airlines Rapid Rewards Credit Card as a referral program to make money with because I carry the card myself and have loved it. I recently earned a companion pass which lets my wife travel anywhere with me for free for 16 months. When you refer someone, you get 10,000 miles added to your Rapid Rewards account, which is enough for a shorter one way flight. To start referring people, you can sign up for the credit card and get 40,000 bonus miles. I’m including this one because of it’s uniqueness. Mannabase is a cryptocurrency that is built to support universal basic income. They pay distributions of their coin to members on an ongoing basis. It’s free to sign up and you get larger distributions for every person that you refer. Check out Mannabase. Speaking of cryptocurrency, purchasing Bitcoin, Ethereum and Litecoin is easiest through an app called Coinbase. I’m not a huge fan of their relatively high fees, but for people who want to start investing in cryptocurrency, it’s the easiest way to go. They also have one of the best referral programs out of all of the exchanges. For each person you refer, you get a flat $10 wen your referral buys or sells $100 of cryptocurrency. If you don’t already havean account, you can sign up for Coinbase for free and start referring, even if you don’t deposit anything. My experience as an Aribnb host has been well documented. Their referral program is solid, giving you $20 in travel credit and your friend $40 when they sign up. Check out Airbnb. I’m sure that we’re all familiar with ridehsaring programs by now, but they can still be a great way to make money with referrals. Uber gives you and Lyft gives you when a new rider signs up through your link. If you don’t already have an account, you can sign up for Uber or Lyft for free. Turo is a car sharing service that lets you rent your car to other people or rent a car from another vehicle owner. When you sign someone up for the free service, you each get a $25 credit toward a future car rental. If you don’t already use Turo, you can sign up for free and get your first $25 credit. This isn’t the best money maker necessarily, but it’s an interesting app, so it’s easy to convince people to use it. Achievement pays you in gift cards for your physical activity. This includes taking steps every day, working out, and even your diet habits. When you sign someone up, you get 100 points, which is the equivalent of walking about 40,000 steps. Check out Achievement if you haven’t already. Most people are familiar with the food delivery service. Their referral program is another great one, giving you and your referral $100 each in delivery credit. To sign up for Postmates, you can get $100 in credit with this link. The referral programs that I’ve mentioned above are all very simple to use. Unlike affiliate marketing, you don’t have to go through a third-party platform or approval process. In most cases, if you are a registered user of the product, or have a login, you can refer friends to get paid. Most of these programs will pay both you and the person that you refer. When you are logged in, they often have a page or a callout on a page that asks you to refer friends. You can refer through social media links, emails, or just a link that you can share wherever you would like. Some companies like Ibotta will have a specific code that your referral can enter when they register. The key in either case is to make sure that your referrals sign up through your link or use your referral code when they register so you can get your paid referral. If someone signs up and you want to claim them as a referral later, this is very hard to do. Most referral programs state very clearly up front how you will get paid. Many of them have options like retail gift cards, Visa gift cards, Paypal, or discounts for their own products and services. Some have minimum withdrawal amounts, so keep an eye out for that if you are planning on doing this as a side hustle. How can you get more referrals? 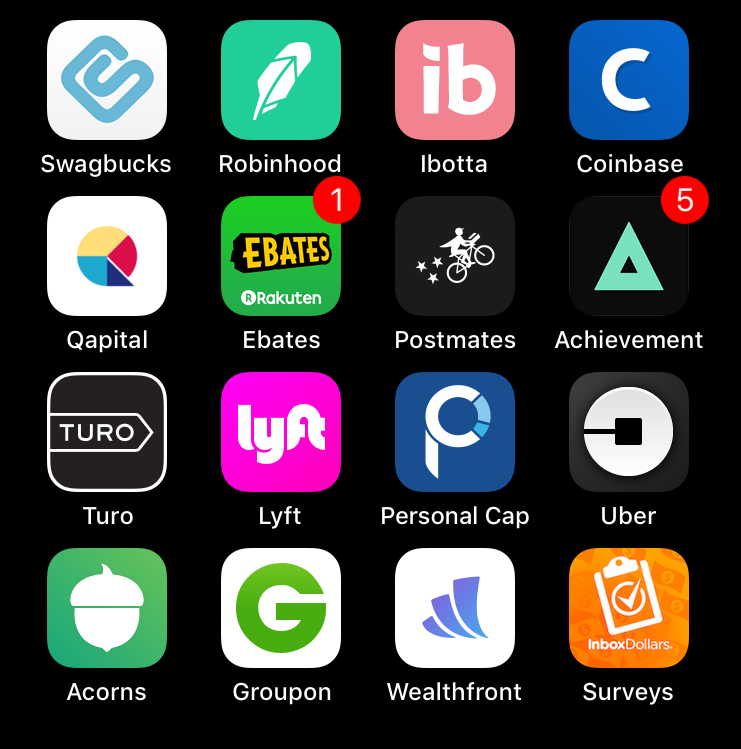 If you have any questions about getting started with any of these apps, products or services, leave me a comment below and I’ll be happy to help.